Review by AllTheBestFights.com: 2015-02-14, fight not particularly exciting between Max Holloway and Cole Miller: it gets two stars. 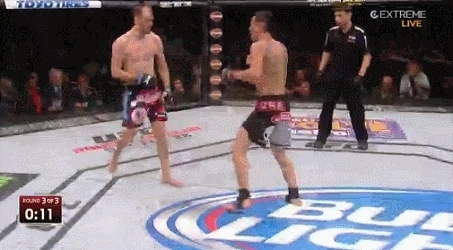 Max Holloway entered this fight with a pro mma record of 11-3-0 (55% finishing rate) and he is ranked as the No.15 featherweight in the world, he suffered two consecutive defeats in 2013, against Dennis Bermudez and Conor McGregor (=McGregor vs Holloway), but after this bout he has won four fights, the last one against Akira Corassani (=Holloway vs Corassani). His opponent, the black belt in Brazilian jiu-jitsu Cole Miller, has an official record of 21-8-0 (86% finishing rate) and he entered as the No.29 in the same weight class, he suffered his last defeat in 2013 as well, againt Manny Gamburyan, and after this bout he has won over Andy Ogle and Sam Sicilia (=Miller vs Sicilia). 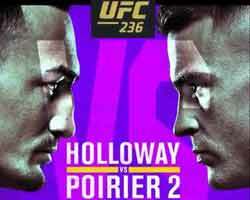 Holloway vs Miller is on the undercard of Benson Henderson vs Brandon Thatch – UFC Fight Night 60. Watch the video and rate this fight! You can try to view the gif directly: http://giant.gfycat.com/GloomyParchedIvorybackedwoodswallow.gif.